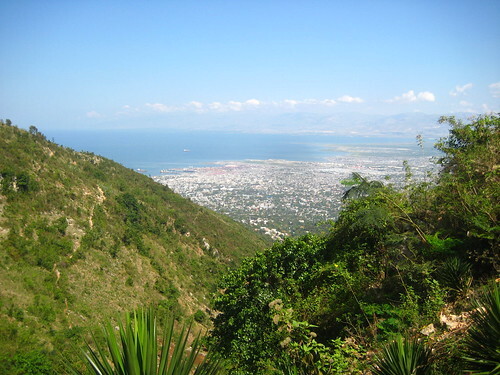 On Tuesday, Leonard took us hiking up the hills above Port au Prince. Beautiful and refreshing after the first intense days of acclimatization here. Leonard pointed out this structure. Though this canyon is relatively forested compared with the rest of Haiti, it’s still heavily deforested, and erosion is pretty serious in spots. Researching later, this structure turns out to be Rock Weir, designed to stabilize the canyon under a steeply falling channel of water; and also, a pretty decent footpath across. Someone, or some organization put in a lot of work. Who are they? When did they do this? How much did it cost? Will they check back on it? What else have they done nearby? All questions we had right there, but we had no answer right there, or anywhere. Aid projects are sprinkled across the country. Yesterday at BarCamp, heads nodded to the observation “The UN is the government of Haiti”. No one has a comprehensive idea about all the work that has been done in Haiti since the quake … How much money has come in? Who has done what? What has succeeded? Leonard has named the Haiti initiative for grassroots aid accountability Tanbou. In one part it requires a means for Haitians to express their views. In the other part, it requires good open data from international and local actors. My suggestion is that IOM eat it’s own dog food, and start publishing it’s projects openly here … even if they are dry and technical, it can be a start. I made a contribution to the effort by adding the Rock Weir to OpenStreetMap. We went back down through a small village perched on the hills, met the head man, and took a look at their schools. 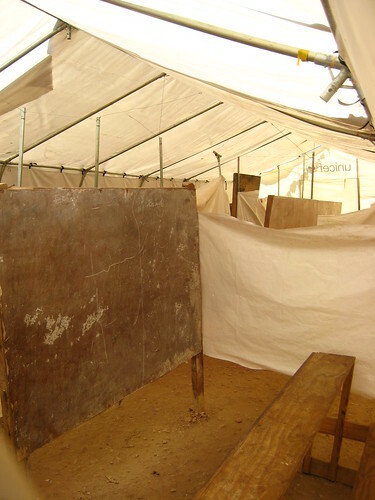 The one above was in an emergency tent, blazoned with the Unicef logo but obviously not distributed for this purpose, with small partitions inside for classrooms. Eighty young students crowded inside here on a school day (school was out today, it was the middle of Carneval) and must have made a racket! Another school was under construction, made of cement, and reportedly financed by the local Rotary Club. I noted all the details, and recorded both schools in OpenStreetMap, using some tags we had developed for collecting school data in Kibera, and noting the state of construction. There was drive and ambition in this village, and they need help. We talked briefly about Facebook presence, and thoughts drifted to how Citizen Haiti might really and truly allow this small place to voice its triumph and needs. The hike was refreshing. The kind of work we need to do was more clear, and I felt I knew Haiti just a tiny bit better. And I was able to geek out, and maybe demonstrate a few ideas linking data collection, media and reporting, and aid feedback. We collected a a few photos, improved OpenStreetMap, and using a small bit of code, linked together maps and media and told this small story.